You already know the value of matching your existing CRM data to offline data. But how accurate is your onboarded data? Would it surprise you to learn that between 50-70% of your data is completely erroneous, due to imprecise statistical modeling and unresolved identifiers? Neustar’s proprietary 3-step onboarding process ensures the most precise, scalable, secure, and privacy-friendly data onboarding capabilities on the market. Our industry-leading authoritative identity and extensive partner ecosystem eliminate the low-quality linkages that lead to media waste. And because we can tie multiple customer identifiers to a single target, your media strategy remains efficient and effective across all channels. Cleaner data, better reach, more effective targeting and measurement—and that’s just the start. 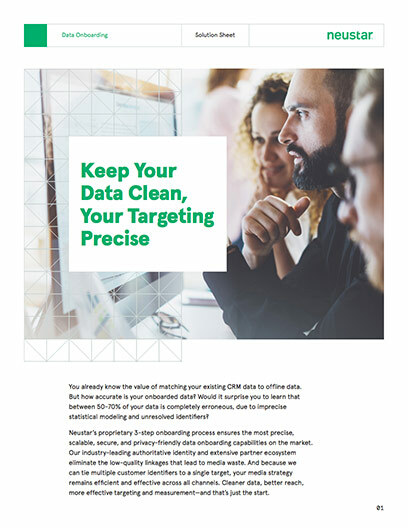 Whether you’re looking for a full end-to-end solution, or to improve the match rate for your existing onboarding solution, Neustar ensures you have the most complete and accurate customer data, and the means to activate and measure that data. Less data leakage. More consistent customer experiences across all channels. The industry’s leading segmentation, targeting, optimization, and measurement solution. Neustar is here to help.